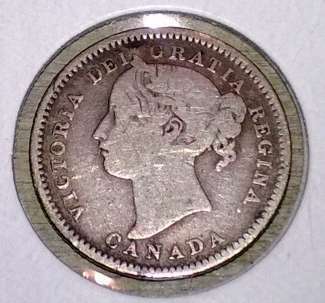 Wondering if someone could help me identify if this is an obverse 5 or 6? I have another that looks different (lower grade) but this is driving me buts. This is my other one. Somehow they don't look the same side-by-side, in hand. But now that I'm looking at the photos, they sort of do. This may sound weird.. but isn't there a very easy tell with the ear and the shape of the eye? Shylo wrote: This may sound weird.. but isn't there a very easy tell with the ear and the shape of the eye? 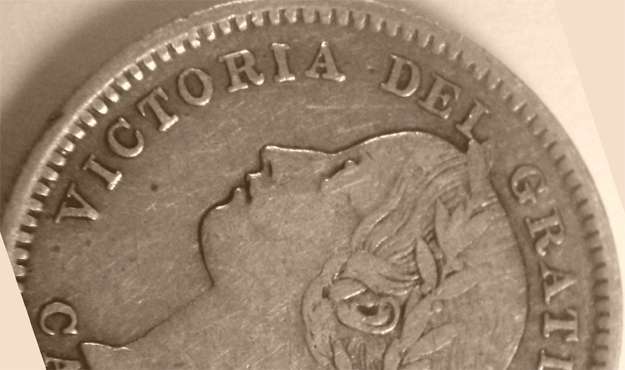 Y'see, now I thought it was the forehead like with the 5 cents. Doh! Now I'm totally lost. 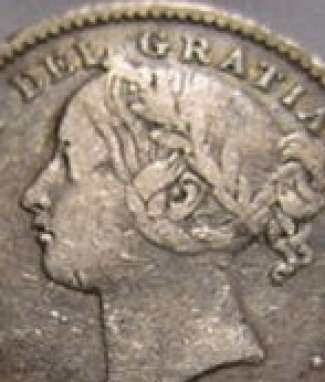 The easiest way that I've found to see the shape/slope of the forehead is to turn the coin so that the bridge of the nose and the point where her forehead meets the laurel are on a horizontal. By doing so I've found your attention is focused on the shape of the "hill", and in setting coins with two different obverses side-by-side in this fashion you'll be able to see that the difference between them is very noticable. There's also a slight difference between obverses along her throat. The #6 runs quite straight down from her chin to her collar bone, whereas the #5 has a bit of a S-curve to it. It's best to view this upside-down. I figured that one out trying to date worn-dates. Ace, I'll post two pics. One of a very nice 1896 obv.5 that I don't own, and one of my G-6. 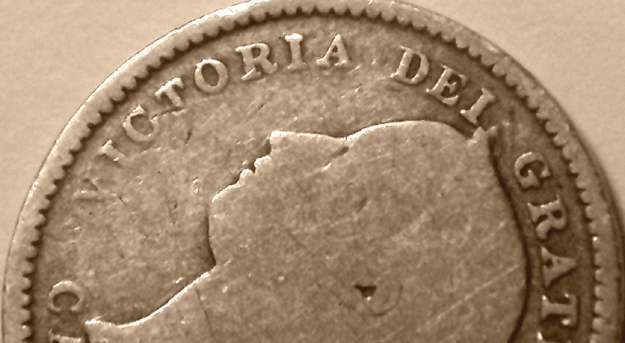 Unfortunately a lot of my Victoria 5c and 10c are deaf and blind. 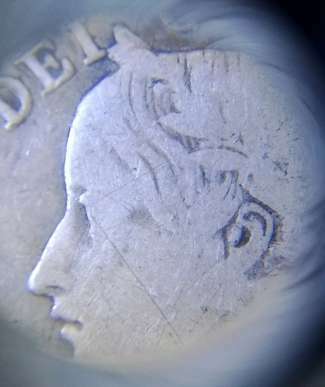 verdigris wrote: The easiest way that I've found to see the shape/slope of the forehead is to turn the coin so that the bridge of the nose and the point where her forehead meets the laurel are on a horizontal. By doing so I've found your attention is focused on the shape of the "hill", and in setting coins with two different obverses side-by-side in this fashion you'll be able to see that the difference between them is very noticable. Thanks, Rod. Fantastic tip. However, with these ones, I've got these two side-by-side (side-by-each, for our Quebecois friends)... I'm seeing two different hill shapes on the foreheads, but what appears to be the same neck. The second one I posted is far more worn than the other, but I still see a difference in the forehead. What's your opinion of the second one, 6 as well? CDNMace wrote: What's your opinion of the second one, 6 as well? ohh wow... I'm looking forward to the pics... gimme more..
Had enough juice to take one photo. You see? The forehead flattens on a #5... not even close to the high curve of the #6, which, as soon as I find another battery I'll take a shot of a 1898 obv#6 so you can compare side-by-heach tabernac! verdigris wrote: Had enough juice to take one photo. That's perfect! I totally see it now. Thanks, Rod!! And you can also compare 'curvey(#5) vs flat(#6)' along the throat. The photo I originally mentioned I couldn't find but moot at this point methinks. Cheers, Rod, for all the help! !